Dri-Cote lubricant is a product that will make your drill bits, saw blades, shaper cutters or router bits cut better and stay sharp longer. It even works well on turning tools to extend edge life, especially when cutting tough, resinous woods. 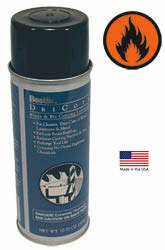 Dri-Cote also helps protect tools from rust as well as wood acids that are carbide's worst enemy. This product is highly recommended for any woodturner. Dri-Cote comes in an 11.5 oz. spray can.